This is my first major project completed in my current shop. My bench is constructed with Hard Maple. The stretchers are Cherry and you can see the Walnut bench dog strips on the top. 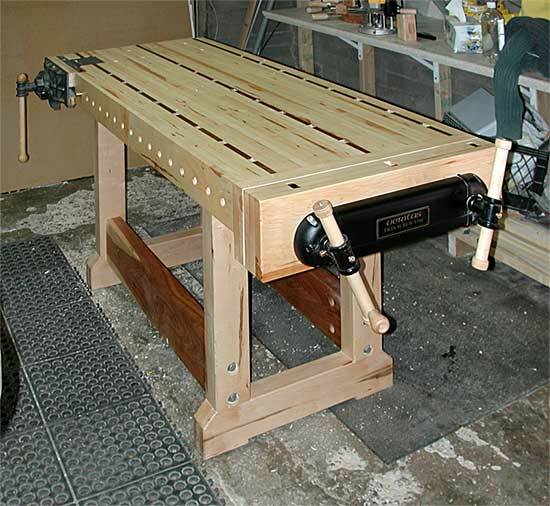 I chose the Veritas Twin-Screw end-vise and a patternmaker's vise for the side. Eventually, I'll add a shelf or drawer/shelf combo on top of the stretchers. Hard maple, cherry, walnut, oil finish.